The Gambia has started a four-day week for public sector workers, with Fridays now an extra day off. President Yahya Jammeh has said the shorter week will give The Gambia's mainly Muslim population more time to pray, socialise and tend to fields. Mr Jammeh, who took power in a bloodless coup in 1994, is known for his eccentric behaviour. Critics say his latest decision will promote laziness and disrupt the poor West African state's economy. Agriculture, especially peanut exports, forms the backbone of The Gambia's economy. It is also a popular tourist destination, because of its beaches. 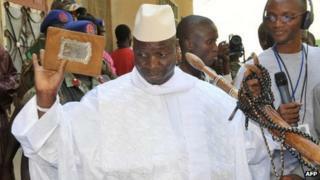 Most people in The Gambia, which has a population of about 1.8 million, are Muslims for whom Friday is a day of prayer. Thursdays and Fridays or Fridays and Saturdays are non-working days in most of the Muslim world but some say this disrupts work with Western countries, who have Saturdays and Sundays off. In a statement last month, Mr Jammeh's office said that from 1 February, the working times in the public sector would be Mondays to Thursdays from 08:00 to 18:00. "This new arrangement will allow Gambians to devote more time to prayers, social activities and agriculture - going back to the land and grow what we eat and eat what we grow, for a healthy and wealthy nation." The statement said state schools would also be closed on Fridays, but were free to open on Saturdays to compensate for the lost day. Until now, government employees have been working a five-day week, from 08:00 to 16:00. The change means they would still work a 40-hour week, but critics say it would be disruptive. They point out that the private sector would still work on Fridays, but would not be able to do any business with the government on that day. In 2007, Mr Jammeh announced that he could cure HIV-Aids in just three days with a special potion of secret herbs. This was widely condemned by medical professionals around the world. Mr Jammeh has also been accused of human rights abuses. Last year, nine prisoners on death row were executed by firing squad, with the president vowing to kill all death row inmates within weeks. He later suspended 37 other executions after an international outcry.